Happy Birthday Dr. Seuss! 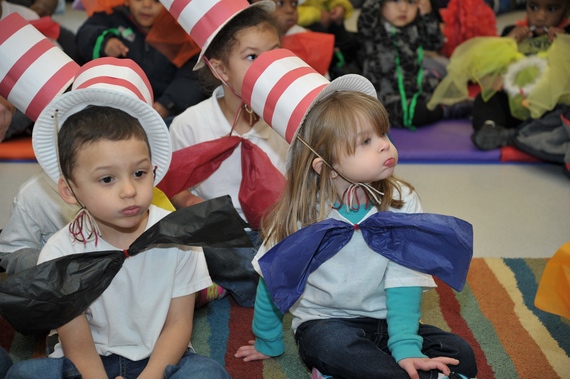 Last week as schools celebrated the 112th anniversary of your birth, kids across America came to school dressed as The Cat in the Hat or The Lorax or Thing One and Thing Two. No doubt you would have loved the honor, but I'm pretty sure you would not have been a fan of what's happening these days in our schools. As they celebrated Dr. Seuss's birthday, I hope our schools were also able to take time away from teaching to, preparing for, and administering high stakes standardized tests to celebrate the imagination, creativity, and fun that are synonymous with Dr. Seuss. Even though there are no test items on his poetic use of language and whimsical characters, there are great lessons to be learned from his books. Green Eggs and Ham, despite what Ted Cruz thinks, tells us to try something new as we may find we like it. The Lorax teaches children about respecting their environment. Horton Hatches the Egg illustrates the virtues of fairness and being faithful to one's promises. Oh the Places You'll Go reassures graduates from nursery school to college and beyond that they have the brains and ability to succeed, even if there are obstacles to overcome. Yertle the Turtle warns of the consequences of trying to get above everyone else at the expense of those below you, perhaps a good lesson on income inequality for certain folks in the current electoral cycle. I could go on and on (Dr. Seuss wrote 46 children's books) but you get the idea. These books may not be on the standardized tests, but they teach children valuable life lessons. Reading Dr. Seuss would be a welcome relief for teachers struggling to make sense of all of the test scores and dealing with fact that many children are still being left behind, widening the gap between kids from high-income families and those living in poverty. It would be a break from the testing that takes so much time away from actually developing a love of learning. While it is important to have standards of what children should know at the end of a given grade, I know Dr. Seuss would have agreed that these standards should guide teaching rather than determine exactly what every child should be learning. "Children's reading and children's thinking are the rock-bottom base upon which this country will rise. Or not rise. " "You were not born to just fit in, you were born to stand out!" To honor Dr, Seuss, let's give teachers some time to nurture children's creative thinking, wide-ranging interests, and unique styles of learning. These days, facts are literally at our fingertips. Knowing what questions we should plug into our search engines and learning how to use the facts we uncover to take us in new directions cannot be measured by tests. As Dr. Seuss wisely said, "It is better to know how to learn than to know."